Foodservice disposables are food containers that are used for one time and then it is either disposed off or recycled. The report by Persistence Market Research provides in-depth analysis and forecast on all the important factors in the global foodservice disposables market. The report offers both historical and current data on the market. The forecast period in the report is from 2017 to 2021. 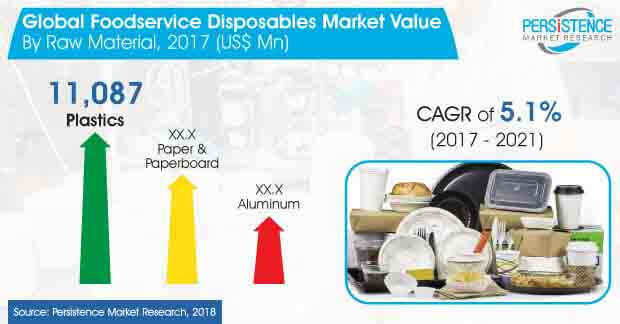 The report also includes market dynamics such as market driving factors, latest trends, opportunities for growth in the market, and challenges in the global market for foodservice disposables. Foodservice business is witnessing an impressive growth. Increasing online channels and apps for food delivery services are resulting in the growing demand for foodservice disposables like cups, plates, containers, etc. The trend of delivering food at home or at any place by the order is contributing to the growth of the foodservice disposables. Moreover, increasing concern among environmentalists about plastic-based products is also resulting in the wide usage of recyclable plastic for making plastic based foodservice disposables. It also helps in managing waste, the majority of the companies along with the production of foodservice disposables have also started recycling foodservice disposables made using plastic. Foodservice providers are also using recycled packaging materials including cups, trays, wraps, plates, etc. Manufacturers have also started producing disposable products using the pulp and plant fiber. This is resulting in the growth of the biodegradable foodservice disposables. Companies are also focusing on offering food products in customized packages with customized print on them. For making customized disposables, foodservice providers are using UV cured ink as it contains no or little VOC that can be harmful to environment and humans. Recently, the concept of edible cutlery has also gained popularity. Companies are researching and developing plates, cups, spoons, containers using an edible material, with the goal of zero wastage. A study by Persistence Market Research (PMR), the global market for foodservice disposables is anticipated to see a steady growth between 2017 and 2021. By the end of 2021, the global foodservice disposables market is estimated to bring in US$ 27,187 Million revenue. Compared to paper, paperboard and aluminum, plastics is likely to emerge as one of the highly preferred raw material for foodservice disposables. Manufacturers of foodservice disposables are focusing on using recyclable plastics. Also, the government of different countries are introducing stringent regulations on using plastic as it is not eco-friendly and take a very long time to decompose, thereby harming the environment. Research and development activities are also being undertaken by the companies to come up with a material for producing foodservice disposables that can be recycled and used again. Moreover, restaurants have also started offering takeout meals, this is also likely to drive the demand for foodservice disposables by restaurants. However, shifting preference of consumer from quick service restaurants is expected to hamper the growth of the global foodservice disposables market. Increasing number of restaurants are using disposable plates, cups, trays, bowls, etc., to serve various food items. Majority of the restaurants have started providing catering services, hence the use of foodservice disposables have also increased. Manufacturers are also providing customized foodservice disposables as per the requirement of restaurants. Moreover, increasing number of customers have started using catering services provided by restaurants, especially during celebrations. Meanwhile, in the recent years, retail stores and hospitality industry have also started using foodservice disposables to provide various food products. A rise in the number of restaurants in developing countries and popularity of takeaway meals is fueling the growth of foodservice disposables in Asia Pacific region.